Note: If you want to use Search Engine Visibility on a domain hosted by another company, we recommend first completing the steps in Set up automatic publishing for domains hosted elsewhere. Search Engine Visibility uses a series of questions about your business to identify keywords that will improve your site's rank in search results. 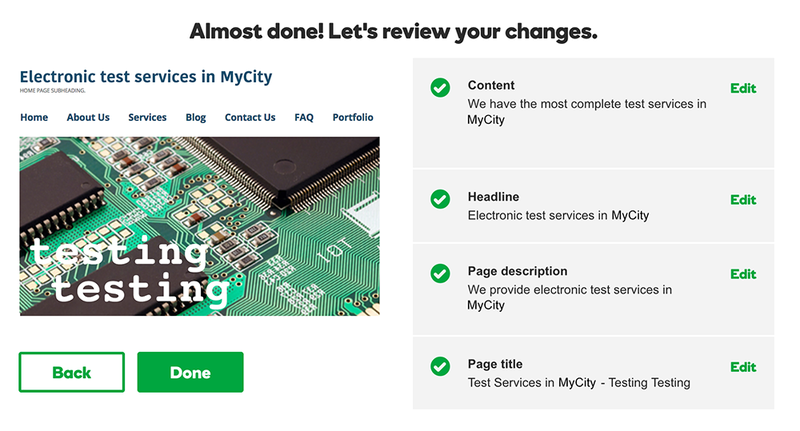 It then uses those keywords to guide you through rewriting your site's headings and summary sentences. We'll start with your home page. In the list of Your websites, select a website and click Start Optimizing. 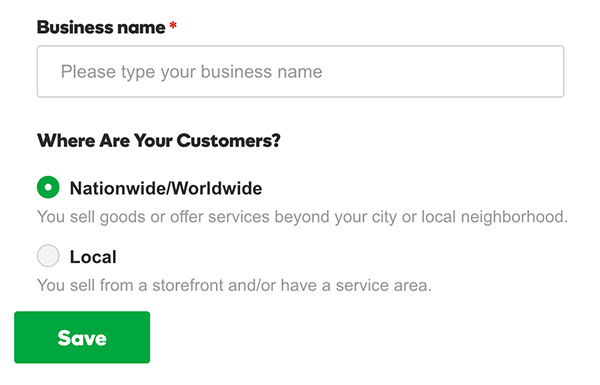 Enter your Business name and then select Nationwide/Worldwide or Local, then click Save. If you select Local, add your city name to Cities/Neighborhoods That My Business Services. Under Primary, enter the main product or service your business provides, and under Secondary add your next most important product or service. 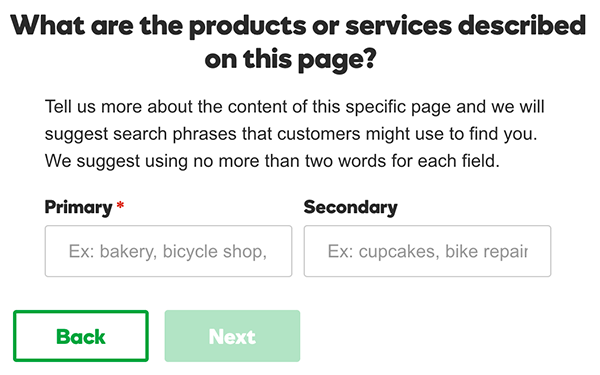 Describe your product or service in only one or two words if you can - that'll help us suggest more search phrases for you. When you're done, click Next. 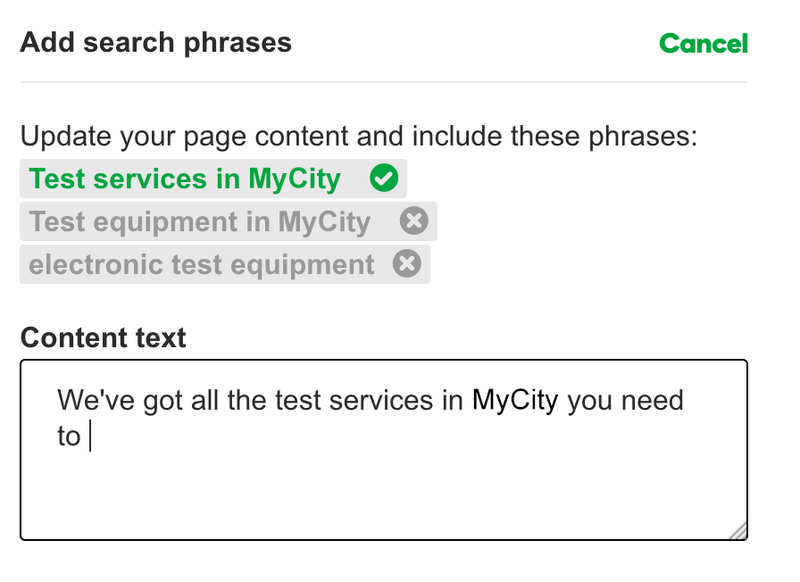 Based on your entries, we'll show you some search phrases that are most likely to improve your site's ranking in search results. 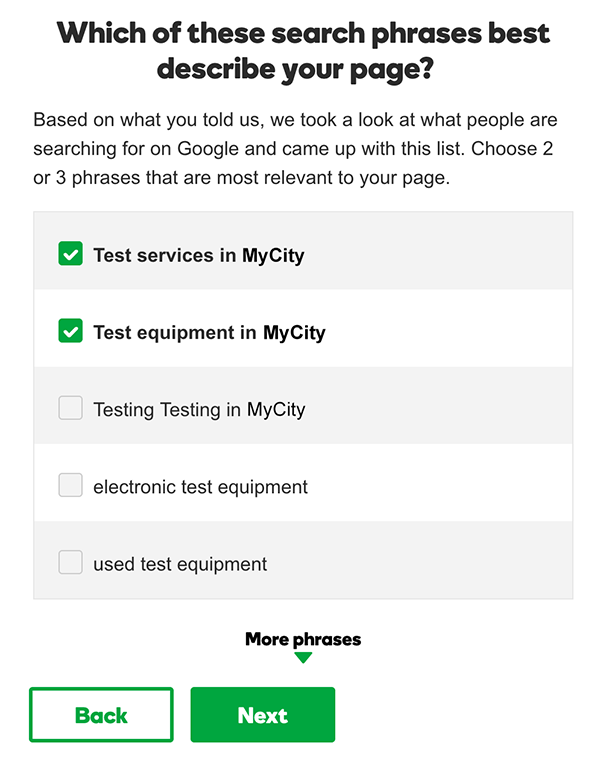 Select up to three phrases that most accurately describe your site, and click Next. You can also click More phrases for more suggestions. Select the phrase that best describes your site's home page and click Next. Select the best title for your home page. If you want more choices, click Load more. After making your choice, click Next. Write a description of your business in the box on the right. Be sure to include your key phrase and location. You must use 160 characters or less. When done, click Next. Rewrite the page Headline to include your main search phrase, and then click Next. 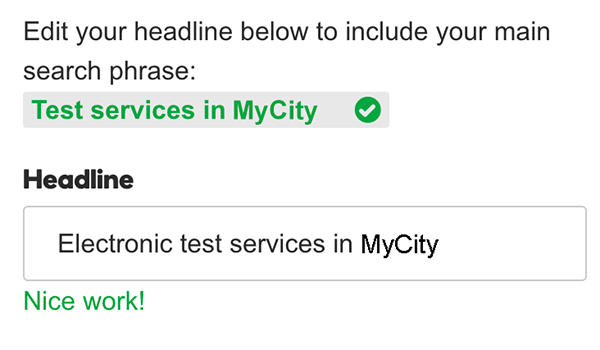 A green checkmark appears when you've added that search phrase to the headline. Note: These are guidelines, not absolute rules. If you cannot find a way to smoothly incorporate the key phrases into your headline or text, it's OK to click Next and then Skip in the alert window. Note: If the new headline doesn't fit the layout because of the font size, you can use your site's formatting tools to reduce its size once you finish all these steps. Each text box includes a line from your current page content. Click in a box to rewrite that line and include one of your key phrases. Checkmarks confirm when you add a key phrase. When you're done, click Next. You're almost done. We'll show you a list of the changes you've made that will help with searches. Click Done to continue. Note: To revise an item in the list, click Edit next to that item. You'll go back to that step in the process. Click Finish. We'll apply all changes to your site. To save a copy of all these changes, click Download changes, and follow the prompts to save the page_changes.html file to your computer. In the SEO Checklist, Optimize Homepage is marked complete by a green arrow. 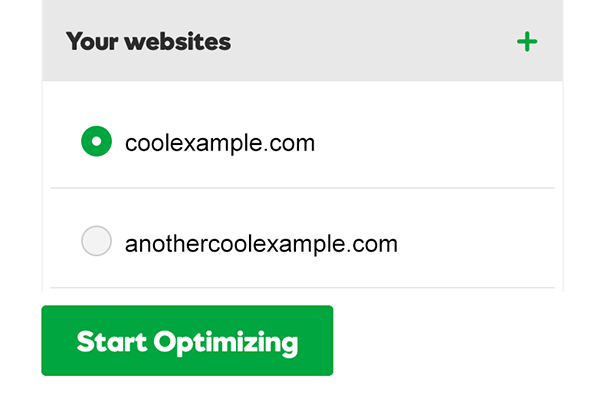 To optimize another page, click Optimize Another Page, and then click Optimize a New Page. Select another page from your website and repeat these steps. Note: Keep in mind that the more pages you optimize, the better your site performs in searches. 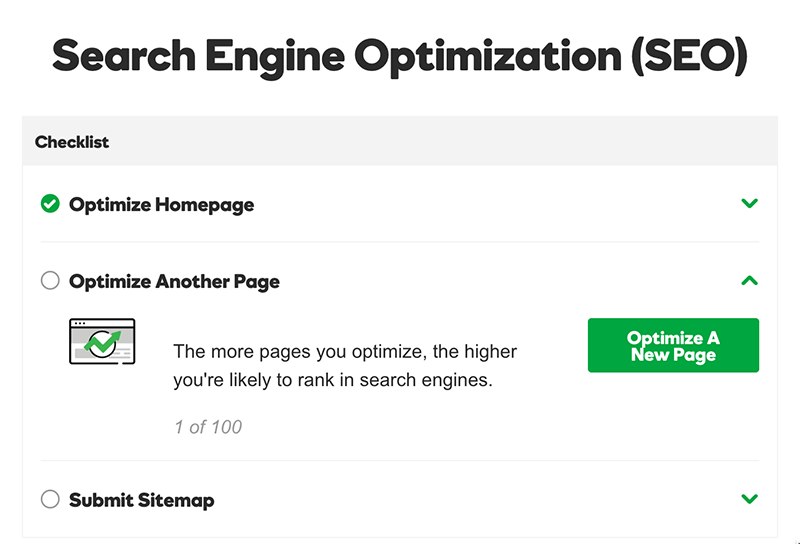 You can optimize up to 100 pages.